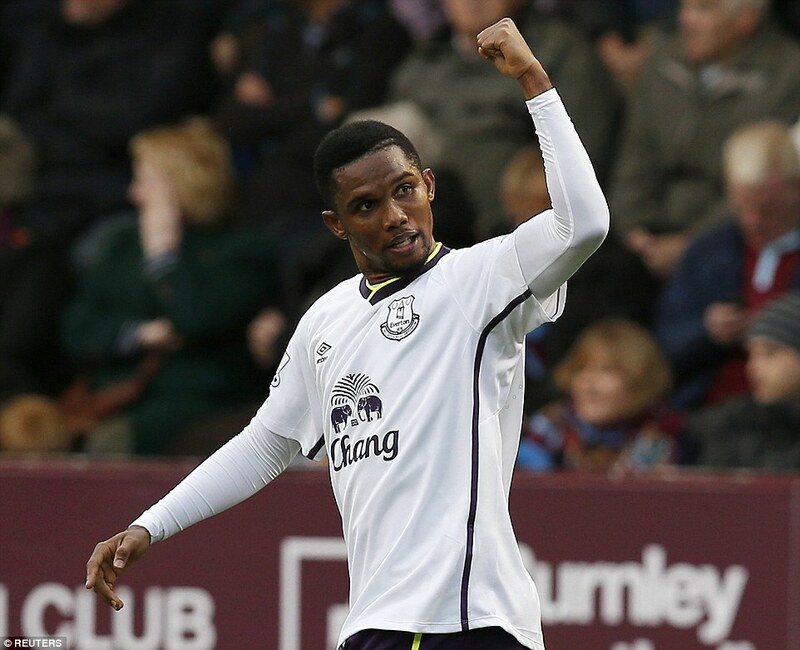 In the end a ‘comfortable’ win, a much-needed post Lille boost, an Eto’o brace, and a move up the table at last. In truth though, we made rather heavy weather of it, and despite the evidence of the scoreline, the reality is that we didn’t seem all that comfortable at all for much of the game, even after a blistering start. I was beginning to think about this piece, and feared I’d have to come out with a few clocks-going-back cliches, which I resisted, and settled instead on an unlikely fall-guy – Seamus Coleman. Don’t get me wrong, apart from the fact that he only seemed to be the normal marauding Seamus on one notable occasion, he would have been to blame had we cocked it up only by virtue of those hideous football boots. When did half and half boots ever look good, let alone half and half fluorescent boots. I couldn’t take my eyes off them. Even Gaz Baz has moved on from his steady and sensible black boots, the envy of every 50 something like me that yearns for the good old days (I don’t really). Sammy Lad has got nice black boots, snazzed up a bit by creative use of red laces. Actually, I think I’m meandering a bit off topic here, let’s get back to the football. But hey, the football was a bit turgid at times, so I had to find something interesting…..
Eto’o got the Sky plaudits for his two goals and his near hat trick, and justifiably so. I’m still like a little boy that makes up his fantasy team in his bedroom, only for my Dad to come in and scoff that I’ve got a player in my team that’s scored once in every game and a half for Barcelona, and once in every two for no less than Inter Milan, and also for his national side. “No-one like that would ever sign for Everton lad”. Well, it really is fantastic and inspirational to me, and no doubt many Blues, to be able to write about this great-of-the-game alongside our own greats like Osman and Hibbert. It was a master stroke of Martinez to bring in ‘young(ish)’ Sammy Lad, not just because of his undoubted ability on the pitch, but you can see what he is doing as he talks to the players around him and develops them in front of our very eyes. Just imagine his influence at Finch Farm? But it’s the way he plays the game that excites me, not just his excellent ball skills that are almost on a par with the quick feet of Naismith, but the way he respects opponents (before making them look like numpties), engages with the ref (tee hee) and responds to the Blues fans in a way that has quickly made him one of our own. If I sound a little star struck, then yes I am, but this guy took a massive wage drop to come to Goodison, so his motivations are clear – he wants to play, and he wants to develop others. And whilst he’s at it, he’s going to score some damn good goals, as he showed at Turf Moor. Meanwhile, it was time for another 30 something to turn in a solid performance. 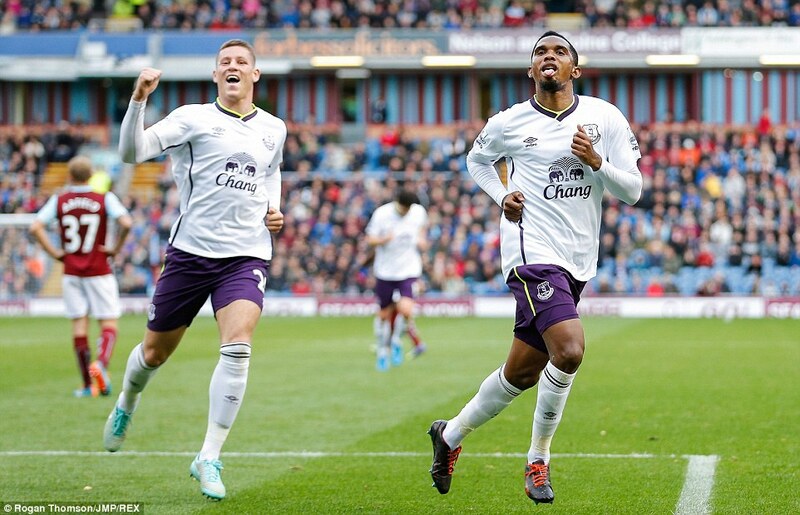 Gareth Barry is our own little Duracell Bunny, he just seems to go on and on. I must admit I thought we’d see less of him this year and more of the returning Gibson and the mercurial Besic. But no, he is almost pre-printed on the Everton team sheets in all competitions, so the lad must be doing something right with his body (if he could let me know, that’d be nice, thank you). He reads the game exceptionally well, almost as good as Richard Gough when he came to play for us aged 103 and always seemed to be where the ball was, such that we had to check he wasn’t actually a remote-controlled player. It’s not just Barry’s reading, it’s his ability to slot in to where the full backs aren’t, his ability to bring the ball away in tight spaces, his passing, his vision, and even an eye for the occasional goal. He’s another shrewd purchase by our Spanish matador, and the contrast to sweet-shop purchases down at the Lane last year, and across the park this year, couldn’t be more stark. Look for quality, never mind the age, and blend it in to a team that will nurture the strengths of old and new alike, and you get the best of both worlds. Send Ginger Jim off to run around everywhere, let Romelu run about to good effect (actually, about that…. ), and we’ll have a team that can actually win things. Let’s Talk About Romelu. He’s a kid. He is still learning his craft, and whilst he’s at it, he’s scored 36 goals in the Premier League and 7 for his country, not to mention 33 for his first professional club. So, 76 goals and he’s only 21 and a half. Blimey. A rare talent, and the talent that persuaded Roberto and the tight-fisted Board to spend a small matter of £28m on him. He made a complete hash of an easy pass that led to their goal today, and all too frequently his first touch had all the subtlety of a UKIP convention. He is not a leading-the-line-by-holding-the-ball-up-kind-of-guy, that’s what we used Victor for, but what he is, unlike Anichebe, is a goal-scoring machine as his record and his scuffed goal today proves. We need to give him time, we need to support him because as sure as anything he’s a confidence player, and we need to develop his talent with the likes of Eto’o and Big Dunc on the Training Ground. What we don’t need is the abuse that some are giving him on social media for his loose pass today. Yes, it was poor, but 9 minutes later, he made amends. That’s what we want, a man that’s going to fight and prove himself. He’ll score 20 this year, mark my words. Onwards and hopefully upwards now Everton, it’s a tightly compressed table at the moment apart form the very top and the very bottom, so we need to keep the momentum going. We’ve got a week off until Swansea next Saturday courtesy of our traditional early exit from the League Cup, so time to heal the wounds, rest the legs, and hopefully – buy some decent football boots.